Data Dots are color-coded labels for your keyboard to match the DataCal template and keyboard label colors for use with control keys. 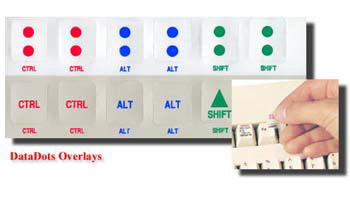 DataDots Labels offer a quick and easy way to color-code the control keys on your keyboard (i.e., CTRL, ALT, and SHIFT). The color code matches the colors used in the DataCal software templates and labels.